DR. CYNDI ASHLEY NETWORK-INTERNATIONAL (C.A.N.-I.)? Dr. Cynthia Oriyomi Ashley a.k.a. "Dr. Cyndi" A Winner who helps others to Win! 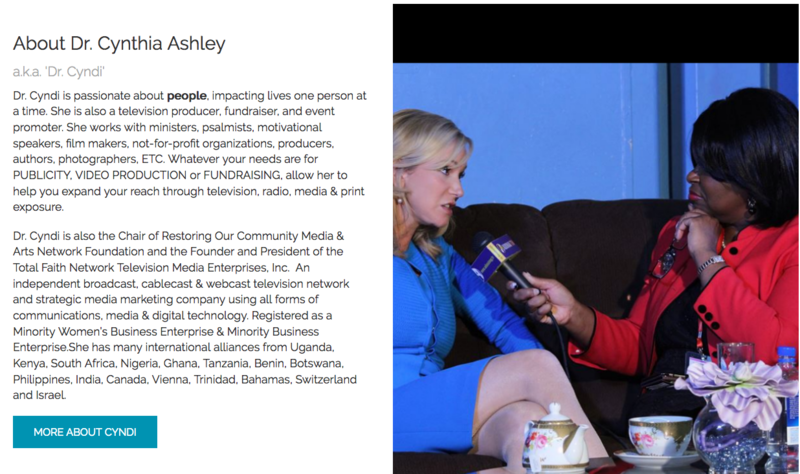 Dr. Cynthia Oriyomi Ashley is the Chair of Restoring Our Community Media & Arts Network Foundation and the Founder and President of Total Faith Network Television (TFNTV) & Media Enterprises, Inc (MWBE). An independent broadcast, cablecast & webcast television network and strategic media marketing company using all forms of communications, media & digital technology. TFNTV produces programming that inspires, educates, challenges, heals and empowers viewers. TFNTV help promote individuals, organizations, cultures, communities and societies at large positively... Dr. Cyndi states, "I believe in the power of visual storytelling and media's impact upon self-identity, self-esteem, self-respect and more! I know each person is uniquely created in the Imago Dei, and we are each interconnected with one another. " A graduate of the New York Theological Seminary, a progressive seminary Dr. Cyndi earned the Masters of Divinity, Master of Arts in Religious Education and the Doctor of Ministry. As a reform progressive educator, she knows precisely her mandate and that is to help transform the way people think, and to strengthen, ignite and empower individual lives through strategic communication tools, media literacy and prophetic prayer teachings. Dr. Cyndi is known for her compassion, humility and transparent demeanor while engaging her audiences to interact with her for their own powerful breakthrough and transformation. A catalyst for transformation interweaving her personal stories of courage and faith, her advanced education with professional insight as powerful tools for change, and with spiritual wisdom to motivate her audiences to harness their power within to live their life out loud, unapologetic and authentically despite life's trials, tribulations and disappointments. Whether her audience is men, women, youth or seniors she passionately offers her own unique blend of media empowerment, spiritual wisdom, recovery and practical life strategies to move them forward and embrace each day as a new beginning. Dr. Cyndi is a publicist, emerging filmmaker, independent certified producer, director, talk show host, author, lecturer, spiritual practitioner & consultant, teacher, community advocate, media literacy educator & scholar, empowerment & recovery specialist. She produces and directs programs on varied topics, which impact the spheres of culture that includes: Religion, Family, Education, Government, Healthcare, Media, Arts & Entertainment, and Business. These presentations have further memorialized key events in African American history, Civil Rights and Womanist movements, urban, civic & world affairs, including issues within the 21st Century church, and societal ills surrounding the disease of addiction and recovery. Currently Dr. Cyndi is writing the biography and producing the documentary of the Late great Tuskegee Airman, Lt. Colonel Floyd J. Carter, Sr. She is also producing a doc-series, "Hidden Stories Untold: Women of Color!" As the Executive Producer of Total Faith TV programs, Dr. Cyndi is also the TV host of the flagship show on TFNTV. TFNTV has access to multiple media formats including: off/online print, video email, radio, Internet radio, interactive & Internet television, and more. Total Faith Network is equipped to produce live streams, webcasts and virtual learning presentation. Currently airing commercials and commercial free programming throughout the country in the Midwest, Northeast and West coast of the United States. Dr. Cyndi is the Financial Secretary for the Greenburgh/White Plains Chapter of the Westchester Black Women's Political Caucus (WBWPC), the Communication Chair of the New York City Housing Authority National Association for the Advancement of Colored People (NAACP) Branch and recently appointed as Director of Global Operations for Pan African Chambers of Commerce (PACC)! Mercy said no! God's grace said yes! Dr. Cyndi's story of pain and survival is very real for her! Since 1994 through Recovery intervention, Dr. Cyndi continues to live free/serene from abuse and of the dis-ease of addiction. She learned to master the storms of life, one day at a time and proves how she totally surrenders daily to a power greater than herself! Dr. Cyndi not only uses prayer as her tool for teaching but prays on purpose with power and authority in/with the love of God! Dr. Cyndi humbly states, "I would not and could not make it in this life without praying myself through all the trials in my life on all levels, and to walk in who I am today as victor and not victim." From the age of 13 to 33 years old, Dr. Cyndi lived bound in abuse with a disease, called Addiction. Much like today, many adolescents, young adults and elders throughout America face the opioid epidemic and drug crisis! As a Recovery Coach Dr. Cyndi uses her experience, strength and faith as points of references when she lectures to audiences of all ages informing them that recovery is absolutely possible on all levels... Read her story in her soon to be released book: "No Trace No Track: Chronicles of My life and How I Overcame Abuse and the Dis-Ease of Addiction." Also to be released are two more books: "The First, Last & Only in the History of the New York Theological Seminary!" and "On Life Support: My Queen Mother's Story Through My Eyes!"